Levi's and the Dumbest Ad Ever! Now who was the idiot photographer that shot that photo? The last thing I would notice in that photo would be a pair of jeans! Even the Jacket is more noticable! So now I am angry because I was hoping to get that sweet Captain America tee, and they want to sell me their crappy jeans! 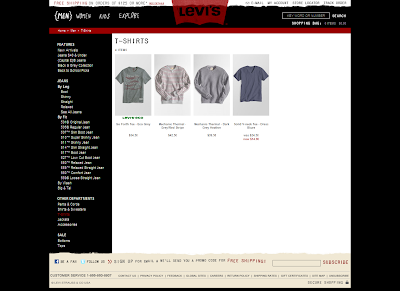 Nice job Levi's now if you excuse me I will be looking for that tee-shirt. Thanks Random Person from the comments below who found the shirt! Turns out that the back version is out of stock, but they still have it in Navy!